My tale today begins in the Hammersmith Socialist League. It is where confirmed socialist and pioneer of beautiful things in the late 19th century, William Morris,met up with a man who knew a lot about books and print. Morris was quite the socialist. He once knocked a policeman’s hat off and went to court for it. And he felt much as that other socialist, George Orwell, felt about beautiful things. Remember 1984, and Winston’s diary? A beautiful, hand-made book: a thing of grace, it tempted Winston back towards humanity: he bought it from a shop full of old beautiful things. It proved his downfall. Morris, in the second half of the 19th century, felt just the same about beautiful things. He felt they made life beautiful; they graced what they brushed. They could prove the saviour of the masses. He abhorred the mass-produced things made by industrialisation. And he fought for a return to something beautiful to feed the soul. He is well-known for fripperies; wallpaper and suchlike – but his meeting with Emery Walker at the Hammersmith Socialist League sparked a friendship and partnership which would culminate in something very beautiful indeed. Orwell’s regime would have burned it instantly. Emery Walker was a typographer, and together with Morris he set about examining early books. ‘Cradle’ books, they called them: icunabula. Together, they made something beautiful. A stunning collaboration of pattern, and image, and print, it was published by William Morris’s own press, the Kelmscott Press, in 1896: Morris’s last great work, with the beautiful pre-Raphaelite visages of Burne-Jones gazing out from the pages. I mention this, because I came late in the afternoon to a church yesterday. A church in Easthampstead, St Michael and St Mary Magdalene, which has been there for 1400 years in some form or other. It is surrounded by new-town houses these days: a democratic town of the people. We walked in at 4pm and it was pitch-black, eerie and hushed, as the light faded outside. But there was just enough light to make the stained glass windows glow with eerie twilight. And here, the dusk lights the faces painted on glass by the illustrator of the Kelmscott Chaucer. 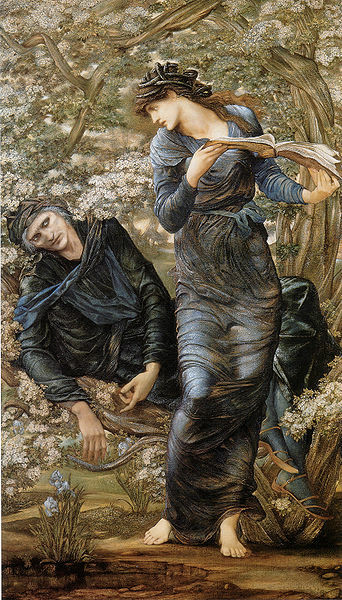 They were commissioned by a local worthy at the height of Burne-Jones’ fame. They are incredibly beautiful, at this time, in this place, lit as they are by fading light. Anyone from the neighbouring housing estates can wander in and see them. It is democratic beauty; though I wonder what Morris and Orwell would have thought of the masses who choose television and shops over this awe-striking sight. The church was deserted and dark. Given the choice, the Proletariat do not always choose beauty. Posted in Places to visit, UncategorizedTagged books, Burne-Jones, George Orwell, Kelmscott Chaucer, St Michael and St Mary Magdalene, William MorrisBookmark the permalink. The windows are beautiful. Seeing them one sunny early morning would no doubt be a very different experience. Yes: flooded with sunlight they must look incredible, Guy. Love the blue sky boasting waves. Glad that the twilight illuminated them just enough for you to enjoy. Me too, Nancy. Surreal experience. I couldn’t find anyone to turn on the lights for us. Wallpaper. I’d forgotten all about that. I would love to see the book and the windows. Thanks Kate. Wallpaper is big here, Tammy 🙂 Nice stuff. Absorbs some of the damp. I absolutely do not know what I would do without your wonderful tours of places I have not gone. Beautiful! Maybe in the twilight hour at the end of the work-week, all the Proletariat want to do is savor something floating in a glass? Maybe they prefer to savor those windows in the morning light of Sunday services? At least they’re not clamoring to have such beauty demolished to make way for the UK’s equivalent of Wal-mart. Do you guys have Wal-mart on your side of the pond? It’s still unwelcome here in NYC. This is true, it is still there. We don’t have Wal-Mart; Costco we have. And there’s a MacDonalds just a short walk away, on the mill pond where Shelley once floated in a tin bath. But that’s another story. Churches have their groupies; but they tend not to be from the new town. There is a small congregation, stalwart; inflated because attendance at church is necessary for entrance to the best local church of England school. Once their child is on role they cease to attend. Our ancient churches are an acquired taste, these days. Beautiful stained-glass windows. Thanks for sharing your visit, Kate. OMG! I love William Morris. I am sitting in a Morris Chair surrounded my best attempts at Art & Crafts style furniture. Our daughter is even named Christina after Christina Rossetti, one of the Pre-Raphaelites and buddies of Morris. 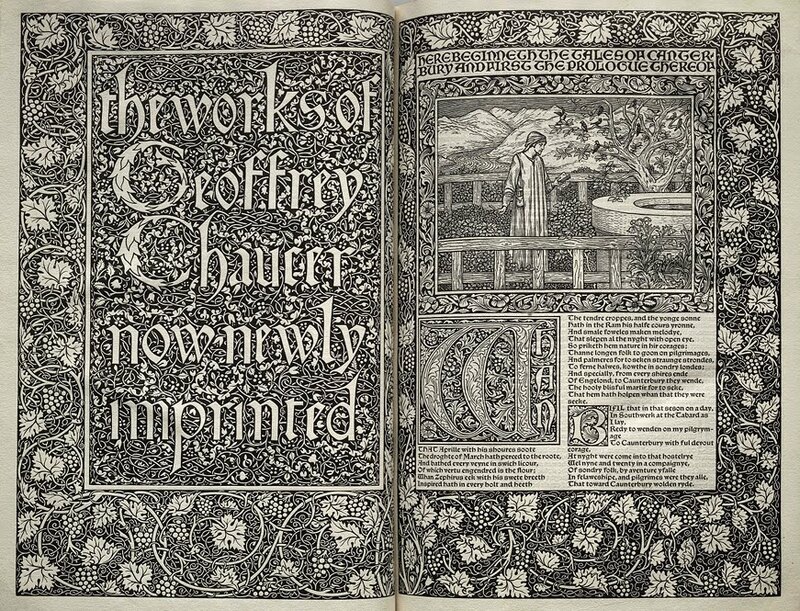 I have held and admired a very rare replica of the Kelmscott Chaucer, but unfortunately never the real thing. I could swoon on forever, but I would sound like way too much fan-boy. Those windows are gorgeous. I am starting, in my head at least, to make vague plans for vacation return to England in the future. You have now just added one more thing to my must do list. So much beauty! I’m in awe of the manuscript’s illustrations, and to be in the presence of those windows had to be a spiritual experience. I hope the people who come and go take notice as you did. It would make the commercialism we’re all drowning in more tolerable! Oh Kate that stained glass is just breathtakingly beautiful! And that book too. You are right, no mall rat will ever appreciate such beauty. What a pity. Fascinating, Kate, and beautiful. I don’t think of stained glass in the fading day’s light, but, now I shall. Thank you. I’d like to bang a drum for Burne-Jones whose designs Morris realised so well. While B-J’s figures usually feel cold and remote they do have a ethereal beauty usually suited to their subject matter. Though I have to say that beauty nearly always makes me smile!